About 3 months ago I wrote about Top Burger opening up in Downtown Miami. It’s located in the old First & First Southern Baking Company spot where I had a not so pleasant experience eating Potato Pancakes. After 4 tries including one weird situation where they were tweeting on a Sunday to come by and enjoy a burger when they weren’t even open, I was finally able to eat at Top Burger. I already knew that I was gonna get one of each item but what would the toppings be? I made it rather simple, Cheese and Bacon on everything except the Fries (there’s no such option for those). I place my order at the counter and then sit down waiting for it to be brought to me. Everyone here is very friendly which was a nice change of pace. In what seemed like no time at all my order shows up. The Hot Dog is served on an open foil while the two sandwiches are wrapped up. The Fries come in a cup in only one size (not upsizing here). My Hot Dog appears to have been victimized as it’s showing some battle scars. Just kidding, I’m sure they did it for cooking reasons. The crispy Bacon & Cheese are nicely tucked into the side of the toasted Bun. I ask for Mustard and got just the right amount. I think the Cheese could be a take it or leave it kinda deal but the Bacon added some much-needed crunch to it. 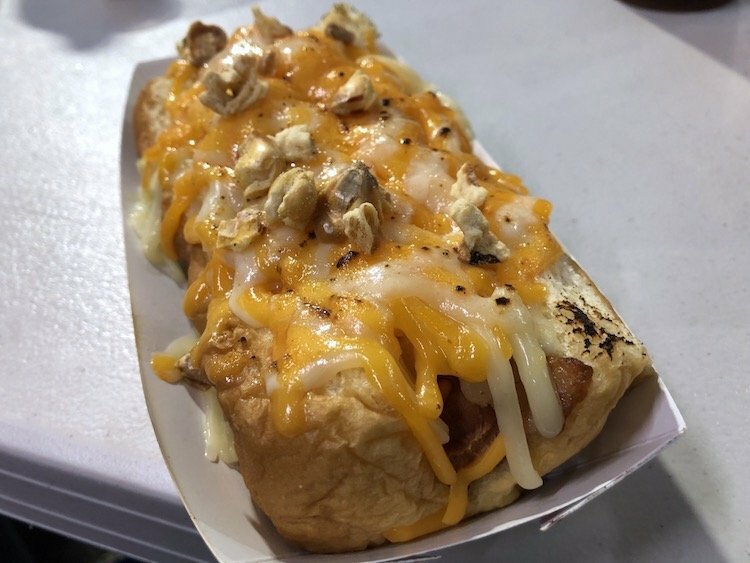 There’s a Chicago-style Dog on the menu too if that’s more your speed. The Dog is bueno. Both the Chicken Sandwich and Burger have their buns pressed and toasted. The Chicken Sandwich is available plain but I added some Cheddar Cheese and Bacon to it. It was a great Grilled Chicken Sandwich and I’m sensing I may have enjoyed it more minus the B&C. The addition of their Top Sauce (more on that later) would have made this more crave-able….big time. The Burger wasn’t much to look at when I unwrapped it. I spun it looking for a good side to take a picture and there it was…melty saucy goodness. Just looking at it right now is making my mouth water. Trust me on this one when I tell you to order the Burger with Cheese, Bacon and Top Sauce, that’s it! Don’t add any of that green stuff or that red round fella. You can thank me via a very kind email for it. If I hadn’t just downed a Hot Dog and a Chicken Sandwich I would have definitely done a Burger Round 2. I had eaten one or two Fries during my feeding frenzy. Once I was a couple of bites from finishing the Burger I noticed a little bit of the sauce had congregated on a portion of the wrapper. I picked up one of the Fresh Cut Fries and dipped it. Someone must have been watching me as I nodded my head like, “Damn, that’s good“. Not even 5 minutes had passed when someone from the kitchen brought me a mini sauce cup full of their signature sauce. All Fries from this point on were either dipped, drowned or covered in the sauce. The sauce has some sort of Mustard/Curry base, it’s not like those Thousand Island-based secret sauces. This one is different and excellent. Yes, I like this place and plan to be back as soon as the next couple of days. Now that I’m a little more educated on what I’m dealing with I have formulated my next meal in my head, the question is what will yours be?